Best dog stairs are just the thing when your dog is having a tough time getting around. Dog stairs are essential in homes with ailing dogs (hip or joint problems such as arthritis) or senior dogs in need of a little help. With the pet stairs in place, your four-legged friend is much less stressed when climbing up to a comfortable couch or bed. Today, we are listing the dog stairs on the market for the all-around health and well-being of your pet. They are a simple, yet effective solution to help your dog get around the home easier and maintain the healthy joints. It is important to take action to promote healthy joint activity; this applies no matter the breed or age of the dog. This is essentially why dog stairs are a practical idea, even for the lively dogs that have no issue in getting around. Over time, the right preventive measures at a young age will pay off later in life. The dog stairs noted below have the ability to give greater comfort to your dog and all relatively easy to set up and your dog will get accustomed to them in a very short period of time. Fortunately, there is a wide variety of dog stairs for any situation. The Solvit PupSTEP Plus XL Pet Stairs are quick and easy to learn and a practical choice for very high beds. It is extremely easy to set up and assemble. Once this set of pet stairs is in place you will no longer need to be concerned about a dog leaping around and getting hurt in the process. The actual pet stairs are manufactured in a solid and reliable plastic material that is designed to easily fold for storage. Plus, the steps are equipped with non-skid pads to make it easier for your dog to make the climb. The Solvit PupSTEP stairs make a practical choice for both the dogs that find it difficult to jump onto a bed or couch and the smaller dogs that are in need of assistance. The Pet Gear Easy Step II Pet Stairs are a simple solution to protect and maintain your pet’s joint health. They are very easy to put together and the carpet squares on the stairs give the stable footing to avoid slipping. The innovative incline of these pet stairs means there is only a need for 2 steps to climb to the desired height. This eliminates stress for the dogs (as well as cats) and can easily accept pets up to 150 lbs in weight. Pet Gear has used the wide stairs to make it more comfortable for dogs when climbing. The extra spacing on the stairs gives ample room to get the entire body on each step. Plus, the spacious climbing area means the larger dogs will also feel comfortable when climbing the stairs. The relatively compact Pet Gear Easy Step II Pet Stairs for dogs up to 75 lbs are convenient and light enough for the small, everyday tasks, such as helping a dog onto the couch or into the car. They are built to be very lightweight and easy to move around the home, but still a very sturdy platform. The Pet Gear stairs are built to be easy to assemble and easily snap together with no need to rely on other tools. A nice feature that is similar to many of the stair sets is the carpet treat for comfort and to avoid slipping. They are intended to be removable to give the option to machine wash after regular use. The Pet Gear Easy Step III Pet Stairs is built with the bigger dog breeds in mind with its 3-step design and 150 lbs weight limit. The pet stairs have the wide, deep treads that make it really easy to use for any size of a dog. Plus, the short incline of the stairs makes it easier to climb and put significantly less stress on your pet. The actual process of building the pet stairs is very straightforward and is a simple process of snapping the individual pieces together – no tools are needed. Also, there is a useful carpet tread on each stair for extra comfort and minimizes the risks of slipping. For complete ease in cleaning the carpet, the tread is designed to remove and is machine washable. The Majestic Pet Portable Pet Stairs have a lightweight 4 step design that is perfect for dogs with arthritis or similar issues (overweight bodies, hip dysplasia, painful joints, etc.) or simply for the senior dogs. The use of pet stairs is practical to minimize the risk of injury in the event of weak bones or legs. The pet stairs are made to be very easy to clean and maintain with its machine washable removable cover which ensures spills, stains, and dirt is very easy to wash off. Adding the pet stairs to the arsenal of dog supplies means they have greater access around the home and will continue to feel independent in later life. This dog stairs for beds will give easy access to a bed, couch, or sofa that would otherwise be difficult to reach. The Paws & Pals Dog Stairs are a perfect solution to let dogs reach a height without straining their body. This set of pet stairs is intended for small or senior dogs up to a weight limit of 175 pounds. It is certain to help the dogs suffering from hip dysplasia, overweight issues, painful joints or arthritis. The 4-step design in a soft, padded material is very easy to climb and gives your pet the independence to reach a preferred resting place, such as a couch, sofa, bed or other. The Gen7Pets Designer Wood Furniture Deluxe Pet 2 Step is built to a nice quality, sturdy, and looks great with other furniture throughout the home. A high-quality set of pet stairs is a lot easier on the joints than having to constantly jump down off high objects. The Gen7Pets Conversion Steps are one of the more stylish options to feature in the home and give easy and safe access to beds, chairs, and couches for the older or smaller dogs. The build is in a high-quality wood construction for a very high level of sturdiness. Also, the stairs are finished with carpet treads for all-around comfort and ease in climbing the stairs. A great feature of these steps is the hidden compartment on the lower step which is a perfect place for storing a wide range of pet treats and supplies. The Foam 3 Step Pet Stair is a simple and practical option to let your dog reach the desired height. Its foam construction makes it a very portable option that can be used throughout the home. Each of the steps is 4.25 inches in height, which is more than enough to easily reach a child’s bed or a couch. This set of pet stairs is certain to appeal to the dog owners in search of the light and portable option and has a small breed dog like a Chihuahua or Maltese. The Crown Pet Products Pet Steps are built in a traditional wooden design with carpeted treads for great all-around comfort. They are built to be very sturdy and look great with other pieces of furniture in the home. This set of pet stairs is certain to appeal to the dog owner that prefers to avoid the less stylish plastic steps. For ease in matching with the local decor, the pet stairs are available in a choice of colors (espresso or mahogany) and each step can open to provide a useful storage area. Even though this is a wooden built set of steps, the assembling process is still quick and easy to complete. The Pet Loader Light 16″ Platform is a different type of pet stairs that is highly practical for use with a vehicle. It makes getting in or out of an SUV a simple and straightforward process. The build of the platform is very sturdy and the carpeting for each of the steps helps to avoid issues related to slipping. The platform is designed to fold up (collapses to about 7.25 inches) to easily fit in the rear of a vehicle when traveling. However, this unit is built in a heavy-duty plastic which makes it a little heavier than other sets of pet stairs noted on this page. It is a practical choice for medium-large size dogs. Why do you need a small or large dog stairs? Gives easy access to the most comfortable sleeping areas throughout the home, such as sofas, couches, and beds. Protects the legs and joints from potential damage caused by regular jumping off furniture. In the process of deciding on the best dog stairs, there are many different factors to consider for the small, medium or large breed dog. A major issue is the present level of difficulty your dog is facing. Also, things like the number of steps, soft steps or hard steps, and degree of incline are worthy of your time to carefully consider. Step number and size – when you are mindful of your pet’s abilities and aptitudes you are in a better position to know the most favorable step count. Also, the step size can vary significantly, so go with the stairs that are most appropriate for your dog’s size and health. If your dog is likely to find it difficult to climb two steep steps, you will want to go with a four-step unit with the less steep incline. Inclination – the inclination of the pet stairs can vary with a climb that seems quite steep to those that are more or less flat. The steep, vertical climb is more stressful for your dog but will take up less space in the home. Width & Height – a basic consideration is the maximum height you want your dog to reach. So, before you start to shop for the portable dog stairs carefully measure the height from the floor to the height of the sofa, bed, couch, or other places of rest. In many situations, the actual height is the foremost deciding factor. Also, the width of the pet stairs should be taken into consideration, especially for the medium or large-sized dogs. The wide stairs are certain to give greater ease of access and comfort for the larger breeds. Grip & Padding – many of the dog stairs are given a covering of soft fabric such as sheepskin. However, for those stairs with a suitable cover, you want to look for those with at least a non-skid surface or texture. This avoids those accidental slips or falls. Also, there are several dog stairs with extra padding for the most comfortable climbing experience, but this feature isn’t always necessary. 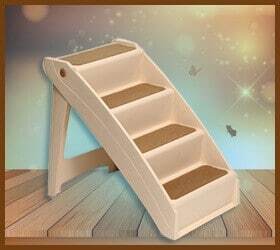 Materials – the construction materials for the dog stairs are a key quality. Wooden stairs give the high-end and luxurious look, while the plastic alternatives are very easy to clean. Storage – the ability to store the dog stairs is only an issue when they aren’t likely to stay in one place for the majority of the time. However, for the regular replacement of the stairs, a set that is easy to disassemble and foldable is certain to appeal. Also, it is worth noting that the sturdier dog stairs are the ones in a single piece that do not give the option to break up or fold up. Whether you are looking for lightweight and portable or the more stylish objects that look much like a piece of furniture, there are plenty of different sets of dog stairs to match the needs. With the best dog stairs in place, your dog is certain to benefit from less stress to the legs and joints when climbing on and off beds, sofas, couches, etc.